I've commented before on the unexpectedly high diversity of animal species that can be found living in groundwater. Because dispersal through this habitat is, unsurprisingly, often difficult and bodies of groundwater are often isolated from each other, many groundwater-adapted species can have almost ludicrously small ranges. 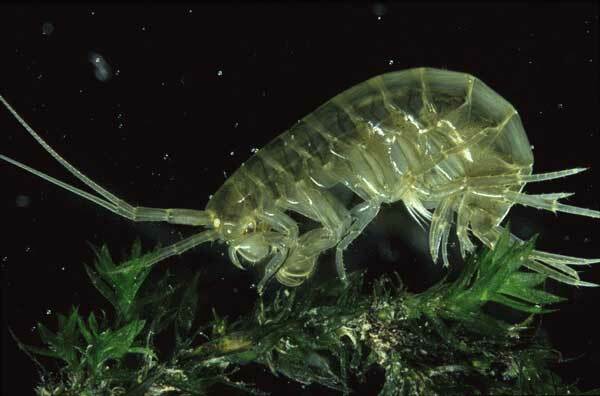 Hence, for instance, the diversity of the amphipod genus Niphargus. Niphargus hadzii, copyright B. Sket. The genus Niphargus is found across Europe, mostly south of what was the lower edge of the northern ice sheet during the Pleistocene, though it is replaced by a closely related genus in the Iberian Peninsula. A few species are also found in south-west Asia. They are usually eyeless and colourless (the genus name means 'snowy white'). Though clearly adapted for subterranean environments, they may also be found in associated surface habitats such as springs or the upper sections of streams (Fišer et al. 2015). Species of Niphargus vary considerably in size: the smallest interstitial species may be only two or three millimetres in length whereas some cave-dwellers reach forty millimetres (Karaman & Ruffo 1986). They may feed on organic particles filtered from the water, or they may predate on smaller animals. Over 300 species of Niphargus are currently recognised, making it one of the largest genera of freshwater amphipods. Even so, this number is likely to be a significant underestimate of the genus' true diversity. A number of studies on Niphargus have identified evidence of previously cryptic species. A study by Fišer et al. (2015) of two species from the Istrian Peninsula in the north-west Balkans found genetic evidence for the existence of two strongly divergent populations within each, with the two populations of 'N. krameri' being morphologically as well as genetically distinct. Flot et al. (2010) found evidence of four distinct lineages within 'N. ictus' of Italy's Frasassi caves, representing at least three independent colonisations of the cave system from external sources. At least two of these lineages are unique among amphipods in living in a symbiotic association with sulphide-oxidising bacteria of the genus Thiothrix, allowing them to survive in Frasassi's sulphide-rich waters. Niphargus aquilex from the River Till, copyright Lee Knight. With such a large genus, attempts have naturally been made to divide it into more manageable units. About a dozen species groups have been recognised on the basis of morphology, albeit some poorly defined. However, a molecular phylogenetic study of the genus by Fišer et al. (2008) identified none of these groups as monophyletic. Instead, they found a higher correlation of phylogeny with geography than morphology. The picture suggested is one of poor dispersers, re-evolving similar forms on multiple occasions as they diverge to exploit their secluded habitats as best they can. Fišer, C., B. Sket & P. Trontelj. 2008. A phylogenetic perspective on 160 years of troubled taxonomy of Niphargus (Crustacea: Amphipoda). Zoologica Scripta 37 (6): 665–680. Fišer, Ž., F. Altermatt, V. Zakšek, T. Knapič & C. Fišer. 2015. Morphologically cryptic amphipod species are "ecological clones" at regional but not at local scale: a case study of four Niphargus species. PLoS One 10 (7): e0134384. Flot, J.-F., G. Wörheide & S. Dattagupta. 2010. Unsuspected diversity of Niphargus amphipods in the chemoautotrophic cave ecosystem of Frasassi, central Italy. BMC Evolutionary Biology 10: 171. Karaman, G. S., & S. Ruffo. 1986. 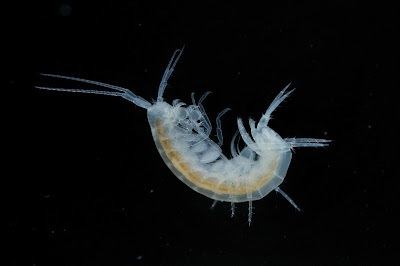 Amphipoda: Niphargus-group (Niphargidae sensu Bousfield, 1982). In: Botosaneanu, L. (ed.) Stygofauna Mundi: A Faunistic, Distributional, and Ecological Synthesis of the World Fauna inhabiting Subterranean Waters (including the Marine Interstitial) pp. 514–534. E. J. Brill/Dr W. Backhuys: Leiden. Is it likely that such crypticism is the norm, so that the 300 known species should be more like a thousand (plus however many have escaped human attention altogether)? I'm, incidentally, having trouble commenting here again. Right now it apparently works from my job computer, but not my private one. I'd have no idea how widespread the crypsis is likely to be. The more epigean species may be genuinely widespread because they disperse more readily, but cryptic species may well be the norm among the hypogean taxa that make up the bulk of the population. I don't know what would be happening with the comments. There's been some indications of background tinkering going on with Blogger recently; my own notifications of new comments disappeared for a while there. Does clearing your browser history help?